We are experts in manufacturing and exporting a wide range of Baby Care Equipment. These are available in different shapes and sizes. This is available at an affordable price to please our clients. 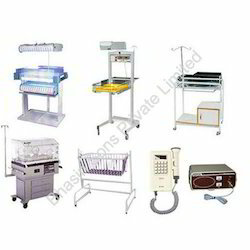 Our products are widely preferred by the maternity wards. The product is famous for its high tensile strength, thickness and stability. All the products listed under this category are Infant Care Incubator, Infant Radiant Warmer, Baby Crib with Attachment, Neonatal Equipment Baby Care Products, Pediatric bed and Baby Cradle. 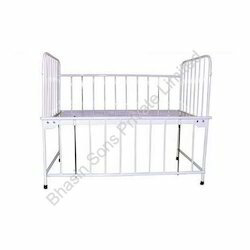 Our squads of well-experienced professionals, we are dedicated towards in manufacturing and exporting Baby Cradle. These products are beautifully designed along with utility box and tray attached with the trolley. This product is specially designed for the comfort of the newly born baby and the Wire mesh hanging make this product best among the other cradles. We manufactured using premier quality stainless steel to ensure its durability. Wire mesh hanging baby cradle. Totally microprocessor Servo Controlled Circuitry. Provided with Dual display for ambient Temp. & Skin Temp. Skin Sensor for recording Baby Temp. Totally Soft Touch control Panel. c) High Temp. Cut Off..
Mute Function is provided when audio alarm is not required. Percentage bar graph of Heater Output is also provided. Mounted on easy roll on castors for easy mobility. Shelves are provided if cabinet is not required. 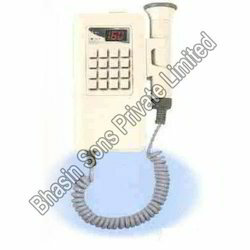 * Electronic Oxygen control system with its Display. * RS-232 Connector for PC Connectivity. Our organization is involved in manufacturing and exporting a wide range of Infant Radiant Warmer. These are elegantly designed and attached with I.V stand. To monitor the reaction of the babies it can be easily attached to the PC using RS-232 Connector. In this product the electronic humidity and oxygen are perfectly controlled by the effective control system. We can find its application widely in the maternity sections. Supplied with visual digital timer up to 999 minutes which is suitable in emergency operation in the absence of untrained user, or can be operated as pre-heat mode. Servo with Microprocessor controls, supplied with Dual digital display for Skin & Ambient Temp i.e. Gross Weight : 35Kg Approx. b) High temperature cut off. Attached Baby Cradle with foam mattress. Mounted an easy roll-on castors. 2. Slow suction for Infants. Under able guidance of our trained professionals, we manufacture and export a wide range of Neonatal Equipments Baby Care Products. Our products are well-known for its excellence and efficiency. It is available in different models according to the customer choice. This product is attached with trendy wheels so that they are brought to the baby’s crib directly to their maternity wards. We use advanced technology and explore modules for the process of manufacturing these products. 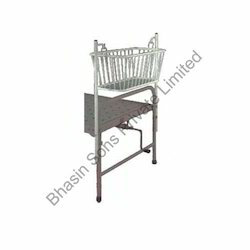 Bhasin Sons Private Limited is one of the prominent and well-established organizations involved in the manufacture and export of a wide range of Baby Bassinet. Our products are manufactured strictly in compliance with international quality standards. 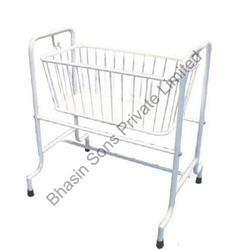 These bassinets cater its application in widely for many pediatric and maternity hospitals. We also additionally provide these bassinets with supplied with resuscitation kit, under surface phototherapy, pediatric slow suction and ambu beg with different masks. Ambu Beg with different masks. 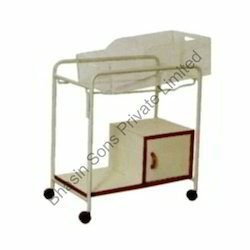 Having well-organized infrastructure facilities, we are able to offer Baby Bassinet with Utility Box. 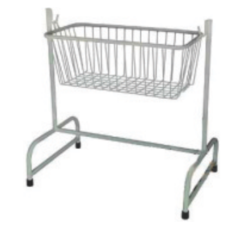 We use advanced technology and explore modules for the process of manufacturing these trolleys. Our products are well-known for its excellence and efficiency. 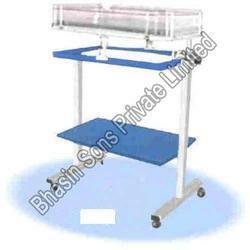 These products are designed along with utility box and tray attached with the trolley. This product is attached with trendy wheels so that they are brought to the baby’s crib directly to their maternity wards. four castors 75mm. Removable crib manufactured from plexiglass. Laminated bottom shelf with spacious cabinet for storage. Size: 90 x 50 x 80cm. We hold the sound name in manufacturing and exporting Pediatric Beds at a large scale. These products are well-known for its steadiness, which are very user friendly and free from corrosion. The foot of the bed is provided with bush that safes the floor from the scratch. It is manufacture using leading raw materials with the utmost care for the newly born babies. We are proficient and well-organized in manufacturing, exporting and supplying a wide range of Hospital Pediatric beds. 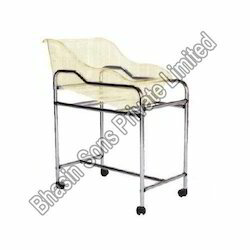 Our product is furnished with hard and precise steel rod to give an additional support to the patient. These beds are being used in almost in every hospital’s accident care unit. We keep an eye on construction, so that the height of the upper round rod is connected equally to give support to its lower stumps. Patients who met with a severe or major accident use our product effectively. 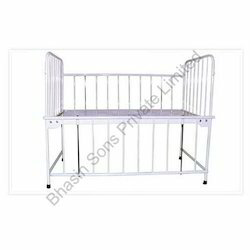 We at, Bhasin Sons Private limited are engaged in manufacturing and exporting a wide range of Baby Crib globally. Due to its precision designed, perfect shape and dimension it attains a unique identity in hospitals. Our products are popular for its rigid body, fine finished surface. These are commonly applicable to pediatric and maternity wards in hospitals all over the world. These cribs are available with us at a competitive price to please our clients. Under able guidance of our skilled professionals, we offer Baby Crib on Stand (Swinging Type). These products are manufactured and are designed in accordance with international quality standards using superior quality raw materials. 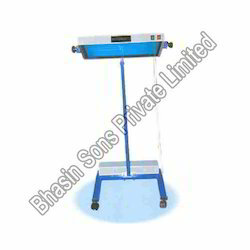 These stands contain oscillatory crib with large space which is connected to a strong support constructed along with perfect finish. This product is used at maternity wards in an ample range near the mother’s bed. With the constant and well-organized distribution network, we manufacture and export an ample range of Baby Crib with Attachment. This product is used at maternity wards in an ample range near the mother’s bed. It is known as oscillatory crib with large space which is connected to a rigid support constructed along with perfect finish. These products are manufactured and are designed in accordance with global standards using high quality raw materials. Having well organized distribution network, we offer an assorted range of Photo Therapy Unit to cater for huge demands from hospitals present all over the world. 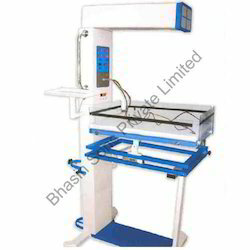 These photo therapy units are manufactured using higher quality raw materials and components to ensure its extreme robustness. 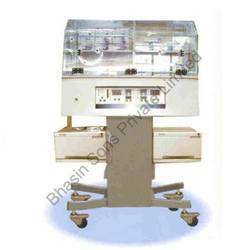 These maintenance-free units are used for being placed in hospitals and clinics. The vital feature of this product is it is provided with six, 2feet white/blue tube light with blue/white filter with switching facility and Baby cradle with transparent acrylic Side Supports mattress for the baby with Angle of tube-source is adjustable. Six, 2feet white/blue tube light with blue/white filter with switcing facility. Blue tubes/filter at a wave length of 420-480mm. at a distance of 45cms. from the lamp. Can work on low voltage. Height is adjustable through a gearbox. Baby cradle with transparent acrylic Side Supports mattress for the baby. Angle of tube-source is adjustable. 3. Seprate Infant care Trolley with Under Surface Photo therapy. Comprising hi-tech infrastructure facilities, we are able to offer a wide range of Fetal Doppler. We comply with research modules of our skilled professionals for the process of manufacturing these Doppler. These products are apparent due-to its matchless quality and worth. It has a wide range of usage many hospitals and clinics due to its specially designed circuit design to perform well, which is very compact is size. We offer these highly-prized products at a very cost-worthy price all over the world. Enhanced performance - works even with obese patients or in case of hydramnios. Low Battery & Mains indicators. Rechargeable Batteries with built-in charger. Operates on Mains also Earphone and recording sockets. Looking for Baby Care Equipment ?